Mr. Roehl has extensive experience in litigation. He has been lead counsel in cases before courts at all levels of the New Mexico and Federal systems, including the United States Supreme Court. He has tried over 50 jury trials to a verdict and has a winning percentage of 85% of those cases. He has had over 100 non-jury trials. In a personal injury case, he set the record for the largest jury verdict ever in New Mexico when his clients were awarded over $12,000,000 in 1992. Mr. Roehl has been involved in complex cases for some time in New Mexico. He was lead defense counsel for Owens-Illinois in the New Mexico Asbestos Cases, a series of lawsuits from 1980-1992 where injured persons sued over exposure to asbestos, resulting in asbestosis and mesothelioma. Roehl was successful in having his client, Owens-Illinois, dismissed from most of these lawsuits because Owens-Illinois had not manufactured asbestos for over 25 years. 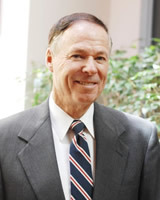 In 1981, Roehl was selected as the lead counsel for the University of New Mexico School of Medicine and its affiliated hospital (“UNMH”) in medical malpractice cases. He was successful in defending UNMH for several years (1981-1998), obtaining defense verdicts for it in nine (9) jury trials. Beginning in 1985, Roehl started to represent catastrophically injured persons. Since that time he has recovered over 50 million dollars for his clients by trial or settlement. His first large plaintiff’s case involved the representation of a 24 year-old man who was severely burned when a rotating drilling head came apart as an oil/gas well was being drilled, causing gas to become ignited and explode. Roehl obtained a settlement in 1987 for his client of $1,800,000. Roehl represented Tiffany Dugan Brosch, the infant daughter of Tim Brosch, a flight nurse killed when the University of New Mexico Hospital’s Lifeguard One helicopter crashed en route to Taos, New Mexico, following a snowstorm on Super Bowl Sunday, 1985. Roehl sued EMS Helicopters and its owner, Ed Zimmer, for negligent and reckless failure to maintain the helicopter. Roehl obtained a jury verdict of $2,000,000, the second highest jury award ever for a single wrongful death in New Mexico. Dugan v. EMS Helicopters, Inc. 915 F.2d 1428, 1430 (10th Cir. 1990). In 1988, Roehl took on six large corporations for three severely burned clients. These clients, Jeff Hinger, David Cupps and George Valencia, were changing out the wellhead equipment on a natural gas well near Dulce, New Mexico when the well erupted, caught fire and exploded. Shortly before the trial, Roehl settled with four of the six defendants for $2,200,000 and then went to trial with the two non-settling defendants, Parker & Parsley Petroleum Co., Inc. and Evergreen Resources Inc.
At the conclusion of that trial, which lasted seven weeks, Roehl obtained in December, 1992 for his three clients the then largest all-time jury verdict ever for a personal injury case for New Mexico courts of $12.1 million. That verdict was affirmed on appeal in 1995. Hinger v. Parker & Parsley Petr. Co. Inc., 120 N.M. 430, 902 P.2d 1033 (Ct. App. 1995). Later that year the case settled for $17,385,000, believed to be the largest settlement ever of a personal injury case in New Mexico. Since that case, Roehl had had several other gas and oil field accidents where he has obtained settlements for clients over $1,000,000. Continuing with his super-subspecialty in oil and gas explosions, Roehl has had cases against several large corporations where he represents gas field workers who were severely burned. Roehl has represented many plaintiffs in the same lawsuit. In the Farmington Allergy Shot cases, he represented all 29 plaintiffs who were injured by a flesh-eating bacteria resulting from an infection due to an allergy shot. In that litigation, Roehl sued several different defendants, three of whom were large multinational drug manufacturers. The lawsuit involved allegations of negligence, medical malpractice and products liability. After several years and four separate mediations, the lawsuit resulted in a confidential settlement. In another case, Roehl is believed to have achieved the largest pre-trial settlement in a medical malpractice case in New Mexico by getting $6,500,000 for a client. Roehl has also represented clients in roll-over Sport Utility Vehicle accidents, including cases against Ford Motor Company for the Bronco model, as well as ATV’s, including a record settlement against Kawasaki. Roehl helps clients with a frightening array of injuries, from quadriplegia to closed head injury with permanent brain damage, from death to severe burns, from horrible disfigurement to comatose conditions requiring mechanical respirators. Roehl also represents clients in commercial law and contractor dispute cases. He has represented General Motors, Ford Motors, banks and other Fortune 500 companies in product liability and commercial/business cases. He and the other Firm members currently represent 70 home owners in a case against Pulte Homes for faulty construction in a residential subdivision. Mr. Roehl is currently listed, and has been since 1984 and 1986 respectively, in Who’s Who in America and Who’s Who in the World. Copyright 2009-2010 | Roehl Law Firm, P.C. | All rights reserved.